How often are you left totally speechless? I mean like Scientology back-story level of dumbfoundedness? 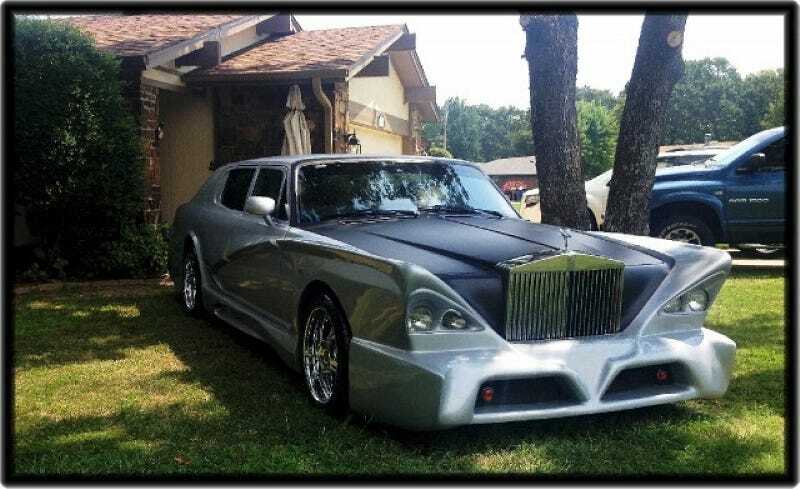 Today's Nice Price or Crack Pipe Rolls Royce is so magnificently outrageous that it borders on the indescribable. Hopefully for its seller, its price is at least in the realm of acceptable discourse. I hope you enjoyed the little Oktoberfest we had the last two days, and I am sorry about its lack of beermaids. Wednesday's BMW and yesterday's Benz both came away big winners - 92% for the Bavaria and 73% for the 300TD, but I think that we given the Germans their play here long enough. As a matter of fact, we've had some pretty cool cars and trucks on the show all week. As much as I'd like to keep that record spinning, we have to jump the groove today as this 1991 custom Rolls Royce Mulliner Park Ward (not really) demands attention. There is no description of of the car offered in the ad. Instead, it requires that you call the dealership's Internet Manager for more info. I don't think so. I fact, I think we can come up with our own explanations for its existence, along with whether we think anyone should pay its $66,500 price. As a bit of background, Mulliner Park Ward was a coachbuilding subsidiary of Rolls Royce. This car is NOT a product of that august marque, but does seem to at least be based on a Rolls Silver Spur II. It is true that a Silver Spur Mulliner Park Ward was offered in 1990 - 25 of them to be exact - however they all came in Bordeaux red. This car is not red. Instead, it is silver over Batman villain, and has obviously been styled elsewhere than the tweedy halls of Mulliner, regardless of how it is presently being positioned. I think it's more of a Rolls Royce Mulliner Fuckwad, but then, I really don't have a filter. A little research indicates that this long-wheelbase Spur may have been commissioned by an Arab Sheik who had the car shipped to England for the work and then backed out on actually taking ownership. I don't know the veracity of that story however, but that's what I would have done. Still, this Rolls is so ostentatious, so out there, that it begs to be seen and rationalized. Sure, it's not something that YOU would buy, but that doesn't mean it won't appeal to someone. After all, this isn't your average car. In fact, it looks like what the Green Hornet would drive if he decided to give up his life of crime fighting and instead become an urban ho-wrangler. It's how the president of the newly founded nation of Grand Tackistan would roll. It's the automotive equivalent of Donald Trump's hairpiece. Finally, it's what Justin Bieber would drive when he's run out of all other ways to disgust and offend proper society with his bieb-havior. Think about this, for the cost of a well-kitted 5-series or just about any other mid-level luxo sedan, you could own this - actually have it parked in your driveway - frightening the neighbors and making you a hero with the kids. If you were to do so, you'll at least get a car that seems to still meet Rolls Royce standards for feature and presence. The interior seems to still be luxuriously appointed, and there's no doubt that this is - and forever will be - the only one of its kind. That's got to be worth something. The question is - on this fine Friday - is it worth $66,500? That question, along with your expressions of disgust and indignation (or applause and appreciation), are what we are here to find out. What do you think, is this wild Rolls worth that crazy kind of cash? Or, is that price just one more of this car's affronts to the senses? South Beach Classics out of Miami FL, or go here if the ad disappears. H/T to Sir Stirling Moss for suggesting the fake Bugatti that led to this Roller.